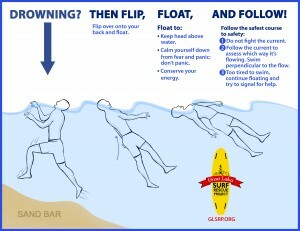 GREAT LAKES, USA – The Great Lakes Surf Rescue Project (GLSRP) urges people and the media to learn, know, and share the updated Rip Current Survival Strategy titled, “Flip, Float, and Follow”. The “flip, float and follow” drowning survival campaign is the result of input from a variety of first responders and water safety groups that participated in the Great Lakes Water Safety Conference, sponsored by Michigan Sea Grant in 2011. A. Float to keep your head above water. B. Float to calm yourself down from the panic and fear of drowning. C. Float to conserve your energy. While you are floating, you are already following the current. Follow the current to assess which way it is pulling you. Then swim perpendicular to the currents flow until you are out of it and then swim toward shore. If you are too tired to swim to shore, continue to float and signal someone on shore for help. Also, the waves may eventually bring you back to shore. –As long as you are floating, you are alive (*cold water hypothermia may set in within one hour, so know the 1-10-1 Rule of Hypothermia, especially in spring, fall, and winter). –As long as you are struggling or fighting the current, you are drowning – Conserve your energy and do not do the Signs of Drowning. If you are too tired to swim to shore, continue floating and signal for help. 1. “DON’T PANIC” – The instruction, “Don’t Panic”, is an ineffective strategy to avoid panic. If you saw someone on fire, would you tell them, “Don’t panic”? No. You would tackle them and say “stop, drop, and roll”. Stop, drop and roll are the ordered lifesaving ACTIONS to take in that situation. 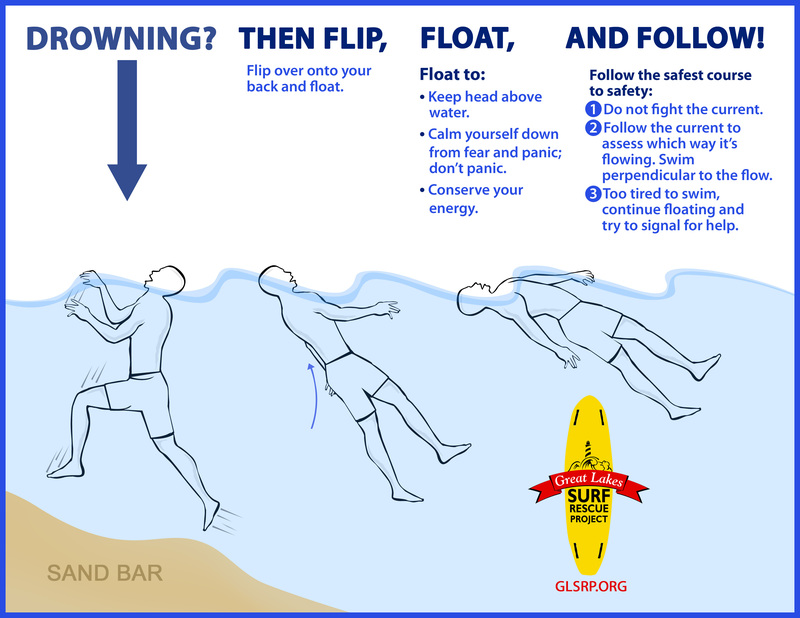 So if someone is caught in a rip current, “Flip, Float, and Follow” – the lifesaving actions one can take to stay alive. As long as you are floating, you are alive. As long as you are floating, you are buying time for safe rescue. 2. “SWIM PARALLEL” – Swimming parallel ‘may’ not always work because Longshore Currents are parallel to shore and Structural Currents are parallel to the structure, jetties, piers, etc. The “Great Lakes Water Safety ” classes are for the average beach goers, surfers, lifeguards, police officers, fire fighters, paramedics, water rescue team members, dive team members, and the U.S. Coast Guard. Recognize the “Signs of Drowning” – How to identify a person in trouble from within a crowd.